Rasam Powder - Rasam Podi - Rasa Podi, this is an aromatic spice blend mix used to prepare rasam. I usually do not use rasam powder for making rasam, instead I freshly grind it each time I make it. But, my mom started preparing rasam powder recently and keeping it handy for her busy mornings. When I visited my mom last time, she prepared rasam using the rasam powder which she prepared. It tasted great! So I noted the recipe from her and here it is for you guys! You can prepare any variety of rasam using this rasam powder. Dried Red Chillies - 10 No. Coriander Seeds - 2 tbsp. Pepper Corns - 1 tsp. Toor Dal - 2 tbsp. 1. 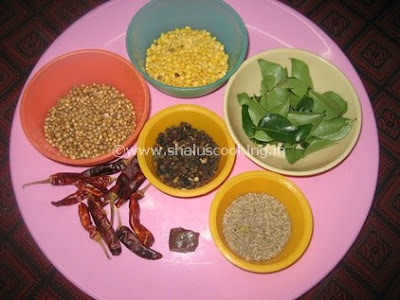 Keep all the ingredients ready to make rasam powder - rasam podi. Note: I missed to show the fenugreek seeds in the below picture. 2. Heat a kadai and first add the toor dal. Dry roast the dal till you get nice aroma and the dal starts to change color. Now add the coriander seeds and saute for 2 minutes. 3. Now add dried red chillies, pepper corns, fenugreek seeds and asafoetida and fry for few more minutes. Lastly add the cumin seeds and fry for 2 to 3 minutes. Transfer the roasted ingredients to a plate and allow it to cool down to room temperature. 4. Add few drops of oil and fry the curry leaves. 5. Once the curry leaves turns crisp, transfer it to the plate which has roasted ingredients and let it cool. 6. Once the roasted ingredients are cooled down, add them to a blender and grind it to a semi coarse powder. i.e, the consistency of the powder should not be too smooth or too coarse. Simple and aromatic rasam powder is ready for use. You can use this rasam powder for any kind of rasam you prepare.